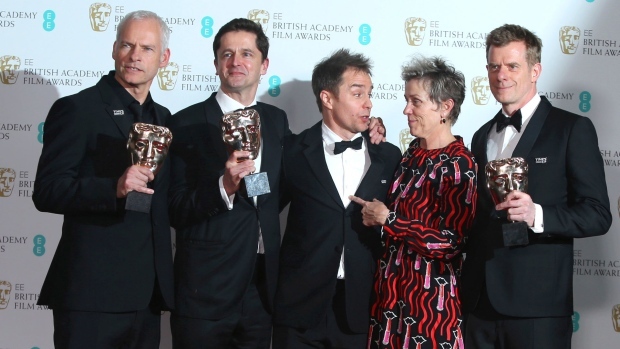 LONDON - Ferocious female-led tragicomedy “Three Billboards Outside Ebbing, Missouri” was the big winner Sunday at the British Academy Film Awards in London, where women demanding an end to harassment, abuse and inequality dominated the ceremony. Martin McDonagh's film about a bereaved mother seeking justice won five trophies including best film, outstanding British film and best actress, for Frances McDormand. “It seems more timely now than we could ever have imagined,” he said. Guillermo del Toro won the directing prize for monster fantasy “The Shape of Water,” which also took trophies for music and production design. The British prizes, known as BAFTAs, are considered a key indicator of likely success at Hollywood's Oscars in two weeks' time. The film awards season in the United States and elsewhere has been overshadowed by the allegations of sexual harassment and abuse levelled at scores of entertainment figures since women began coming forward to accuse Hollywood producer Harvey Weinstein last year. England's Old Vic Theatre has been rocked by allegations against former artistic director Kevin Spacey. London police are also investigating nine claims of sexual assault by Weinstein. The red carpet and the auditorium at London's Royal Albert Hall were a sea of black as actresses such as Lupita Nyong'o, Angelina Jolie, Jennifer Lawrence and Margot Robbie eschewed colour as a statement against sexual misconduct and gender inequality. Several actresses brought feminist activists as guests, and men showed solidarity with “Time's Up” lapel pins. “But I want you to know that I stand in full solidarity with my sisters tonight in black,” she said. On the red carpet, actress Andrea Riseborough, who brought U.K. Black Pride founder Phyll Opoku-Gyimah as her guest, said she also hoped the film industry was on the road to greater equality and diversity. “It's more likely we'll see an alien onscreen than we'll see an Asian woman at the moment, which is disgraceful,” Riseborough said. Prince William - the British Academy's president - and the Duchess of Cambridge were guests of honour at Sunday's ceremony, hosted by “Absolutely Fabulous” star Joanna Lumley. Kate acknowledged the evening's muted fashion by wearing a dark green Jenny Packham dress with black belt. The call to wear black put Kate in a delicate position, because the royal family is careful to avoid political statements. Ahead of the ceremony, almost 200 British women in entertainment called for an international movement to end sexual misconduct. The stars called for an end to impunity for abusers and announced a fund to support women and men battling workplace abuse, modeled on the “Time's Up” movement in the U.S.
Former “Harry Potter” star Watson has given the fund 1 million pounds ($1.4 million), according to its page on the Go Fund Me website. The 80-year-old director Ridley Scott, whose films include “Blade Runner,” ”Alien,“ ”Thelma and Louise“ and ”Gladiator,“ received the academy's highest honour, the BAFTA Fellowship. Daniel Kaluuya, the 28-year-old British star of “Get Out,” won the rising star award and made a plea for public arts funding, which helped him get his start. Kaluuya, who is also Oscar-nominated, joked that success meant taking Ubers rather than the subway. “I get that Prius everywhere,” he said.